Challenge the cynicism of companies seeking to profit from women working for women’s equality. Women’s campaign groups, equalities organisations, and individual gender advocates in Scotland do amazing things, often with very limited resources, and little attention. 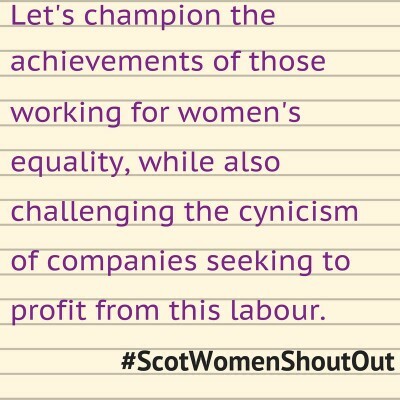 Scottish feminist organisation Engender is asking you to highlight the people and groups making women’s equality happen, to celebrate their work and inspire others to take action using the hashtag #ScotWomenShoutOut. One of the reasons Engender is doing this is because they have seen a surge in awards events and ceremonies that seem to be more focused on turning a profit than championing the hard work of the equalities sector in Scotland. One example of that was covered by a news article on Commonspace’s site about ‘Creative Oceanic’; the company also running the Scottish Women’s Awards. Often these awards events will claim that nominations come from the public, but evidence of this on their social media channels has yet to be seen, and they often give no information on how categories are decided or judged. But nonetheless, to attend what is referred to and even seen as the “glamorous” awards ceremony, dedicated women’s and equalities campaigners are asked to pay upwards of £100 per seat – illustrating just how little such companies understand – or care – about a sector in need of funding. While no one doubts that any and all of the women and women’s organisations nominated at such events absolutely deserve to have their work recognised, as far as Engender is concerned, this is clearly an attempt to profit from women’s labour and activism, without offering anything of substance in return. And of course many awards ceremonies do charge for attendance. But ethical awards are led by people from the communities they commend, prioritise genuine public engagement in nominations, offer valuable media engagement opportunities to winners, and generally tend to know something about the sector they are celebrating. So of course let’s celebrate the women who are nominated in these awards ceremonies, but also let us show the wider picture. And let’s champion the achievements of those working for women’s equality, while also challenging the cynicism of companies seeking to profit from this labour. 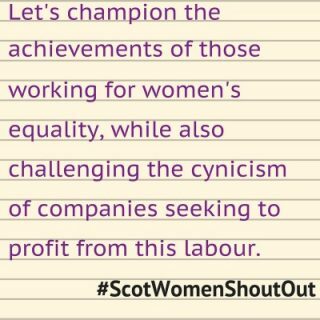 Join Engender on the hashtag #ScotWomenShoutOut and let everyone know who you want to celebrate as a champion for the women of Scotland.